Pebble Beach Company, headquartered in Pebble Beach, Calif., owns and operates the world-famous Pebble Beach Resorts, including The Lodge at Pebble Beach, The Inn at Spanish Bay and Casa Palmero. The company also operates four renowned golf courses including Pebble Beach Golf Links, Spyglass Hill Golf Course, The Links at Spanish Bay and Del Monte Golf Course. 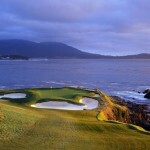 Its other famed properties include the scenic 17-Mile Drive and The Spa at Pebble Beach, and it annually hosts premier events such as the Pebble Beach Concours d’Elegance, the AT&T Pebble Beach National Pro-Am, the TaylorMade Golf Pebble Beach Invitational, the Pebble Beach Food & Wine event and the Nature Valley First Tee Open at Pebble Beach. Site of the 2019 U.S. Open, Pebble Beach Golf Links has hosted five U.S. Opens, four U.S. Amateurs, one PGA Championship, and numerous other tournaments. John F Kennedy Airport (JFK), La Guardia Airport (LGA), and Newark Liberty International Airport (EWR) all offer one-stop flights to Monterey Peninsula Airport, which is roughly 15 minutes from Pebble Beach. John F. Kennedy Airport and Newark provide non-stop service to San Francisco International Airport (SFO), which is a two and a half hour drive from the resort. Flying into San Jose is also an option.